Pictured above is the top of 3 hard disk drive bays of a DEC Micro VAX computer system shown with a DEC RD54 skid place partially inserted. On the left and right sides of the skid plate are the white chassis slides which hold the drive in place once it is screwed unto the skid plate. In the center of the skid plate one can see the upside down "U" shape of the copper grounding strip which covers part of the logic board once the drive in installed unto the skid plate. 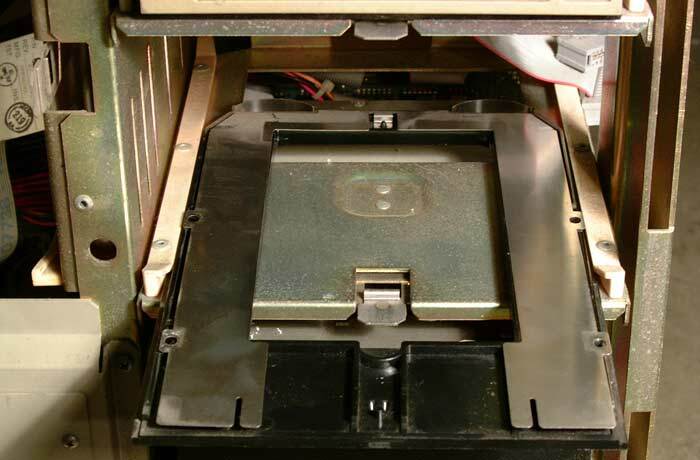 Two semi-circular spring tabs at the forward end of the grounding strip make contact with the chassis at the rear to offer extra grounding to the drive to protect the electronics board from interference. Visible in the upper right hand corner are the two gray ribbon cables and connectors which connect to the rear of the drive. These two cables are the address and data cable which interface the drive to the controller board of the computer.